Able to pay tuition as well as living and other expenses incurred while studying in Japan. Mentally and physically sound (well), and committed to observing the laws of Japan as well as the rules and regulations of the College. * JLPT N5 or higher certification, or an equivalent amount of study (150 hours or more), must be attained prior to applying for a student visa to learn Japanese. Students planning to attend graduate school in Japan after graduating from FFLC must have completed 16 years of formal education (prior to enrolling at FFLC), graduated from a formal 4-year degree program at a university, and possess diplomas from the above. ･ Basic steps of the application process do not differ from the above charts. However, these three courses commence only once each year, in April (no students are admitted for October enrollment). 5. Entrance Exam Fee: Please send your payment to one of the following accounts. For International Students studying at their own expense at universities, graduate schools, vocational schools and 2-year colleges in Japan, the Ministry of Education, Culture, Sports, Science and Technology offers the Honors Scholarship for Privately-Financed International Students. Students who have demonstrated 1 year of outstanding grades / marks and class attendance are eligible to apply for the scholarship. 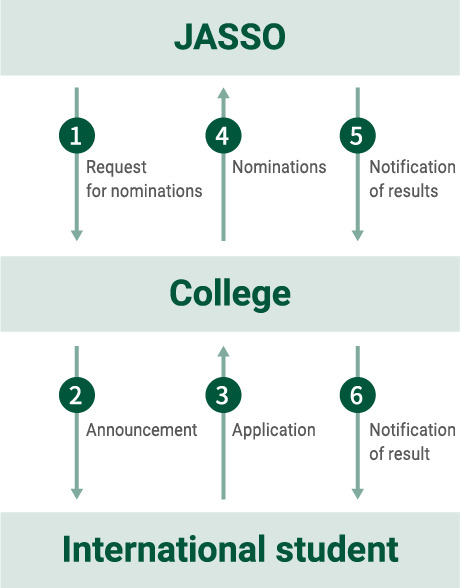 It will be awarded to successful applicants during their second year. 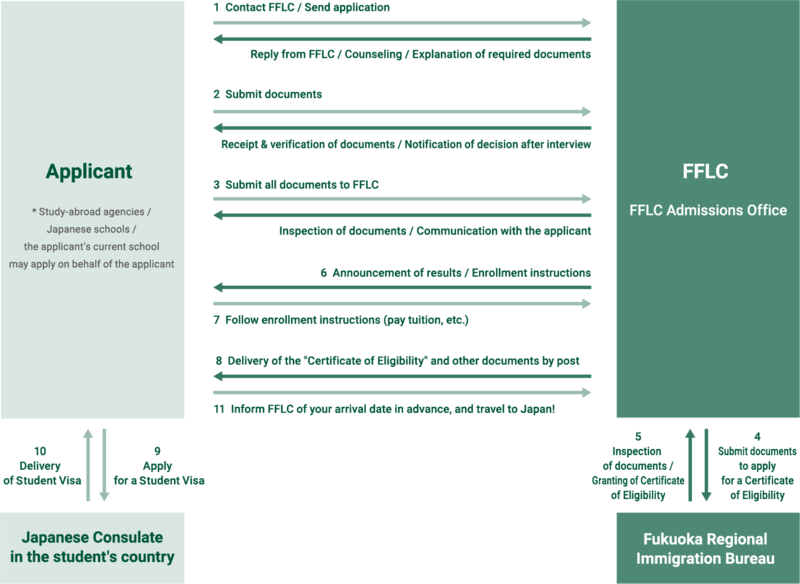 Following an announcement and explanation session at FFLC, applications will be accepted through the College (①, ②). Follow the application instructions provided at FFLC and take the selection exam (③). The names of exceptional candidates will be forwarded to JASSO, and after the necessary procedures are complete, the scholarship funds will be distributed. FFLC provides scholarships to aid outstanding foreign students in their studies. Students who have demonstrated 1 year of outstanding grades/marks and class attendance are eligible to apply for the scholarship. It is awarded to successful applicants during their second year. An announcement will be posted at FFLC. Follow the instructions to submit an application and take the selection exam. The scholarship is awarded over a period of 5 months in monthly installments of ¥20,000.